I've been in contact with CW today and the venue for the August GTG, which will be on Saturday 31st, has been changed to London. Now OK, London is a pretty big city, but I think it will be safe to assume that the venue will be readily accessible by public transport. More details to follow (when known). As to the upcoming Manchester GTG on 27th April, there is still plenty of opportunity to attend and have the opportunity to see the C60 Trident MkIII, due for release on 1st May. Please PM me if you would like to come along too. Thank you. 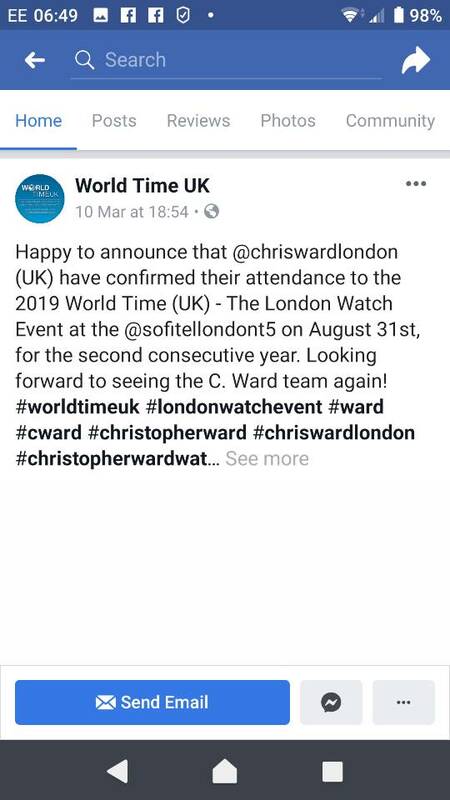 CW will be at the World Time UK event taking place at the Sofitel London Heathrow, T5 on 31st August, along with a multitude of other watch brands. Great location for those in the South East. Park and Ride from your place then, Gary? yeah, not an issue for me. Bus stop 100m from house. I have just spoken with Olivia @ CW and whilst CW will be exhibiting at the World Time UK event @ Heathrow on Saturday 31st August, starting at 5:00pm, they ..
. . . . . will also be holding a separate GTG, along the lines of the Edinburgh & Manchester GTGs, in Central London (venue TBA) also on Saturday 31st August at, probably, 12:00pm to 4:00pm. We are all welcome to attend one or the other, or even both. To those that have posted comments about the World Time UK event its location and format etc. I apologise for causing you angst by not posting the full picture in the first place (case of 2 + 2 = 5). Now that we are into April, I thought it was worth giving this thread a bump as the Manchester GTG will take place three weeks on Saturday, the 27th. This will give those who attend an opportunity to see the C60 Trident MkIII close up before its release, along with meeting fellow Forum members and CW Enthusiasts. If you intend to come along, please drop me a PM, including your full name, and I will add you to the list of attendees. As we had for the Edinburgh GTG there is the opportunity to post your questions to be asked during the 'Chat with Chris' - here. Unable to make it but hope those attending have a great time viewing the new C60 prior to its release and chatting to the 'big three'! I would like to book myself and my wife in to the Manchester GTG. But I don’t have enough posts to use PM, could you book me in from this post or is there another way I should be going about booking in. Excellent, I'll get you and your wife booked in Nick. Once you have a few more posts, I'm sure you will be able to send me a PM with your details. Thank you very much for sorting that out for me. Could you let me know if I need to do anything else, for instance could you advise what time or times we should turn up, and if there is any form of booking in process to follow when we get there. Is there a set schedule for the GTG, presentations talks, or do we just turn up and see what’s going on on the day. Apologies if this is all obvious to the more experienced. "The next GTG - Chat with Chris will take place in Manchester 2:00pm to 5:00pm on Saturday 27th April 2019 at the Double Tree Hilton, Piccadilly"
CW and the venue will have a list of names of those attending for security. Starts at 2:00pm, meet and mingle. The Chat will happen sometime. Refreshments will be on hand.